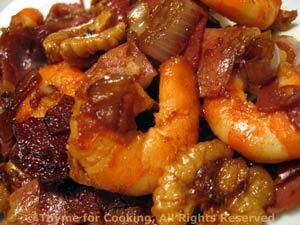 Shrimp, Prosciutto and Walnuts, Thyme for Cooking gourmet starters. Less work than wrapping the shrimp in the Prosciutto but with the same flavors. The walnuts add a nice contrast as well as being good for us. Clean and thickly slice shallots. Heat oil in a medium skillet. Add paprika and sauté briefly. Add shallots and sauté until tender and starting to brown, about 10 minutes. Add walnuts, Prosciutto, and sauté until Prosciutto starts to get crisp, about 5 minutes longer. Add shrimp and sauté for 3-5 minutes, until raw shrimp curl and turn opaque or cooked shrimp are heated through. Sprinkle with soy sauce, stir to combine and serve.